The Projects Abroad Botswana Conservation Project has already welcomed many volunteers from all over the world, to the project in the Central Tuli Block. The most noticeable difference for all the returning staff has been the amazing change in the bush. Having been through the worst drought since 1983, it seemed impossible that the bush could recover to the normal lush green that epitomises summer. But nature is incredible and just a few showers of rain gave trees the strength to sprout leaves, grasses to suddenly appear and everywhere we look there are wild flowers. The rainfall has been very good this year and we have had 488 mm which should ensure that the winter is not as harsh for all the animals that live here. Projects started last year have continued and we have introduced some new activities and courses. All our volunteers have participated with eagerness and have contributed to the on-going research that we are doing on the Reserve as well as having experienced some really fun activities as well. One of the favourites remains the sleep-out where volunteers spend the night at one of the hides on the Reserve and get the opportunity to observe some of the many species that only appears at night. We have had very good leopard and hyena sightings and everyone who has visited so far this year has been able to see the Wild Dogs who traverse the Reserve. Much work has been done removing old fencing, patrolling for snares and clearing out and enlarging natural waterholes which now are all full of water. Many volunteers arrived having never knitted in their lives and we now find them, in their spare time, knitting squares which will be made into blankets and donated to the children of Mathathane for the coming winter. New alliances have been formed with Bird Life Botswana, Wetlands International and a Baobab specialist from the University of Pretoria in South Africa. Volunteers have all been able to visit a nearby Reserve and track white rhino on foot, they have taken part in local craft classes and have made good progress in painting the primary school in the local village, Mathathane. Below are some of the specifics of the projects we are involved in. Enjoy!! We have 2 on-going projects dealing with elephants, namely Identification of specific elephants and herds and a study of the Elephant Diet on the Reserve. 1. We have had good rains this summer, and the bush has recovered from the worst drought since 1983. Elephants are now able to spread out and feed all over our Reserve as well as all the adjoining Reserves because we are in an unfenced environment. 2. Because of the good rains, elephants are able to stay dispersed because all the natural waterholes are full of water so elephants are able to feed and drink in more remote areas. 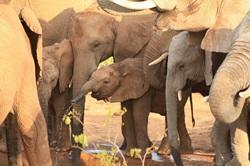 They are not reliant on the pumped waterholes on the Reserve at this time of the year. Any opportunistic sighting of elephant is recorded , usually when driving on the Reserve to and from other activities. So far we have photographed and positively identified 4 known breeding herds and 2 bulls. Any unique marks are noted for future identification. We are building up a portfolio of the animals as well as the composition of the herds and when they are seen. As we move into autumn and winter vegetation will begin to die off again, waterholes will dry up and the elephants will start to frequent our known hides from where we are best able to compile these Identikits as the elephants need to drink every day and will come to these waterholes. And the other 3 are still to be identified. We have formed an alliance with a Botanist from Pretoria University in South Africa. She is an expert on Baobabs and is very interested in the data that we are able to collect. What is more interesting is that it appears that there may be 2 species of baobab, not easily distinguishable other than by providing samples which can be tested, however we have offered the services of our volunteers to participate in this study and look forward to finding out which trees we have on the Reserve. During the survey of the baobabs the volunteers have repaired 3 trees which had suffered damage. One has been lost but the other 2 continue to grow. We will have to monitor them to establish if repair work is viable. Damage to these trees is often attributed only to elephants however much more information is needed before they can be blamed. 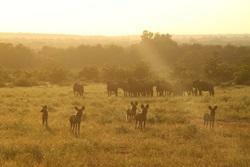 A neighbouring reserve has a 2,500 hectare fenced area which has no elephants. We have been granted access to this area in order to study the baobabs there and perhaps be able to compare results with areas that do have elephants. We have a number of camera traps which are placed around the reserve in order to capture images of animals walking passed. From this we are compiling a Mammal Inventory on the Reserve. Although we think we know what is here, it is sometime surprising to see what is ‘caught in the act’. This project initially used line transects on the reserve where each camera was positioned along a 2km transect line with an equal distance of 250m between each of the 8 camera traps. This method provided some data but not what we had expected, so we decided, based on local knowledge of traversing patterns, to deploy the cameras in a more random way on known animal paths. The results so far have confirmed the presence of the following mammals: Impala, Baboon, Elephant, Kudu, Vervet Monkey, Klipspringer, Blue Wildebeest, Civet, Grey Duiker, Leopard, Brown Hyena, Spotted Hyena, Springhare, Zebra, Steenbok, Eland and Bush Pig, large spotted genet, scrub hare, banded mongoose, warthog. One of our supervisors was driving back to camp late one afternoon and a honey badger ran in front of him. He stopped the car and got out and followed the honey badger up one of the koppies. By the time he reached the top he just saw a tail disappear into a hole so he sat nearby and waited to see if it would come out. It did not so the next day he set up a camera trap at the hole to see if we could get some pictures. Well we did get some pictures. But not of a honey badger!!!!! When we downloaded the camera there were pictures of 2 leopard cubs on the trap!!! Fantastic sighting as we had not seen the cubs at all!! We have also had some amusing video footage of a crocodile, a leguaan and a baboon. First we saw the crocodile protecting a nest of eggs, then we saw a baboon come to raid the nest and as he was trying to grab about 4 eggs a leguaan arrived and fought him for them!!! Our volunteers have spent many hours at the hides on the Reserve recording all the species of birds that they see. Before they go out on these sessions they attend a training course called How to Identify Birds which makes their job a lot easier out in the field. 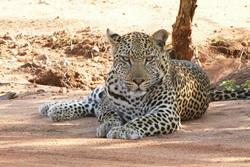 Since January 2013 they have identified and records 111 species of birds at our hides and along the Limpopo river. Worthy of note are the Shaft Tailed Whydah, Lanner Falcon, and Knob-Billed Duck . Amongst the migrant birds identified are woodlands kingfisher, steppe buzzard, a variety of cuckoos, barn swallow, spotted fly catchers, red-back shrike plum coloured starlings, carmine bee-eaters, European bee-eaters, white-fronted bee-eaters, little bee-eaters, marabou storks, saddle-billed storks, spoonbill storks, yellow-billed storks, Amur falcon. We have undertaken to contribute to the country-wide census of birds for Bird Life Botswana. It requires that we conduct a count every February and Every November using the method that they provide. We then collate the results and submit them to Bird Life Botswana. In February 2013 we conducted 2 such counts and managed to identify 59 species on one count and 57 on the other. Spoon bill, Abdim’s stork, Africa Fish eagle, Africa Darter, blacksmith lap wing, and Egyptian geese. As we progress in the year we hope to see more and more birds in the Thune area. The Spoor Identification activity involves volunteers going out with our guides and looking at animals tracks which they can then identify. Of particular interest has been predator tracks and volunteers have been taught to identify the various predators that traverse the Reserve. They also note any other tracks that they find and the following tracks have been seen on this activity, that have not been caught on the camera traps, thus giving a more complete picture of the Mammal Inventory of the Reserve. Africa Wild Dogs, Giraffe, Jackal, Caracal, African wild cat and Lion. 2,300 samples of vegetation have been recorded this year so far. 890 are Mopane trees which represents 39% of all the vegetation recorded in an area of about 12 square kiometres. 31 different tree species have been identified and recorded. 12 species of grasses has been identified and recorded. 52 species of flowers have been identified and recorded. 6 species identified are alien species and we have started removing them. Most of the old wire fencing has been removed from the Reserve and volunteers will noe be helping other Reserves in the area remove their old fences. Invasive plant removal has been a very busy activity as areas of the Reserve have been invaded by Smelters Bush – this is a species that originates in South America and is believed to have been brought into the area in horse food. After a couple of really heavy rains the roads on the Reserve have needed repair. We are happy to report that our snare patrols have resulted in 7 snares being found snce the beginning of 2013 – a great reduction in numbers thanks to having the resources to patrol regularly. We have introduced a course on Tree Identification which volunteers have attended. This helps a lot in the Vegetation surveys. The conservation lecture continues to provide very lively debate between the volunteers and gives much food for thought.